Behold the power of magical yellow repair liquid. Let’s address the elephant in the room: yes, this is a game in which you play as a naked stick figure with his genitalia hanging out while urinating into holes. The visuals could have been drawn by a grade schooler in MS Paint as they are comprised entirely of boxes and circles, and the game released on April Fool’s Day. Coupled with the low price of $3 (made even lower by the game’s launch week sale of 33% off), Safety First! seems like obvious shovelware destined to stink up the Great Deals section for years to come. It would be easy to write this off, but the fact that this comically lowbrow game had somehow sneaked its way onto the eShop was so outrageous that I simply had to purchase it with some spare gold coins on my account to see what was up, and what I discovered was not at all what I expected. As described on the title screen, Safety First! 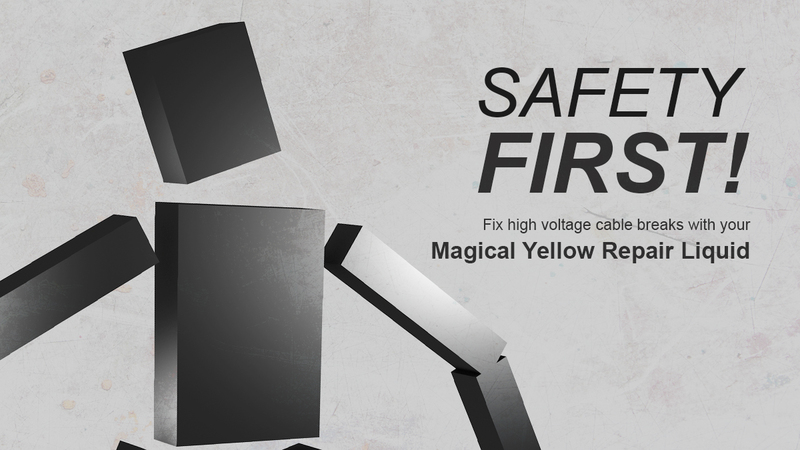 is a game in which you are tasked with fixing broken cables by filling them with Magical Yellow Repair Liquid (MYRL). Utilizing the… “dispenser” located between your legs, you must fill every hole in each stage in order to restore power to your grandma’s radio so she can once again listen to her favorite tune. Even the youngest of children will see past this goofy facade for what the game is really about, but for the sake of the review let’s just take the premise at face value. At its core, this is really a physics-driven puzzle platformer all about moving your legs, where the challenge is in simply attempting to shamble about in a vaguely humanlike fashion. The left stick controls your left foot, while the right stick controls your right foot. If your legs spread too far, expect to watch your character split apart while the best gore effects the game can muster spray across the screen. Initially, it’s simple stuff. Savvy gamers will quickly realize that the game has a very loose definition of physics, as you can lift both feet off the ground and easily float to your destination. Don’t think that this makes the game any easier however, as doing so can cause you to quickly lose control of your feet and make a mess. Aiming your limited supply of MYRL at holes located anywhere but the ground can also be a hassle thanks to your unfortunate tendency to stretch just a little too far while trying to hit that perfect angle – but once you get a grip on the game’s mechanics, Safety First! proves to be extremely addictive. Stumbling and sliding your way through the game’s 30 stages is a blast as each level introduces new gimmicks to literally keep you on your toes. Success isn’t always easy, but the ridiculous ragdoll deaths prove entertaining enough to keep your morale up even on the tougher bits. Should a level prove too difficult, you can even “cheat” to skip it after dying five times. Unfortunately for your accident-prone avatar, the game doesn’t end there. There are actually a total of… wait for it… 69 levels. The next set of challenges are found in Advanced Mode, in which your character finally reads a physics textbook and discovers that it is, in fact, not possible to lift both feet off the ground at the same time. Saddled with the brutal reality of gravity, you must complete another 32 stages under these new restrictions while even more new tricks such as moveable objects and inflatable MYRL are introduced. These stages proved to be even more fun for me than the previous ones thanks to how silly yet gratifying it is to simply make it to a destination by putting one foot in front of the other. Lastly, a mini seven level campaign takes place in space, where no gravity exists at all. Space is easily the most brutal of the three modes and you’ll come to appreciate its mercifully short length as you repeatedly fail to complete simple tasks while your legs contort in unfathomable ways. But wait, there’s more! While the default play mode is set to NRML, completing ten levels will unlock PEP mode in which the game runs at twice the speed, making even the most basic of levels more insane. Completing twenty levels unlocks DRNK mode in which the game’s soothing soundtrack is replaced by grungy rock. Your keg-sporting character will drunkenly stumble around and swear in German as the world shifts and shakes, and your MYRL changes from yellow to brown. Completing a stage in these alternate play modes will earn you a shiny gold (or dull brown) star on the level selection screen, so the game’s replay value is effectively tripled. The game’s eShop page also boasts of its included achievement system, but this seems to be more for gag purposes than anything else since there’s no way to actually view achievements after they initially pop. As I mentioned in the opening paragraph, the game’s graphics must be seen to be believed. Even the home screen icon is hysterically slapdash – if you don’t have a shiny stick figure relieving himself on your Switch menu, then you’re not really living! In contrast to the rest of the game’s intentionally crude presentation, the soundtrack is minimalist in a good way. Rather than taking the easy joke option and setting the action to a mind-numbing cacophony of irritating noises, Safety First! employs some truly bumpin’ techno beats that subtly progress and evolve as you complete each stage. PEP mode has not only speedy gameplay but also its own set of music, evoking the fast-paced electro drum soundtracks of games like Ape Escape and Super Monkey Ball. And of course, those who actually want to play alongside an awful discordant mess can pick DRNK mode to hear the aural equivalent of getting a root canal. Safety First! truly is an experience best played with headphones, or at least with the sound cranked up. Special mention must be given to the legendary credits music, which lets you listen to the fabled favorite tune of the protagonist’s grandmother. If you wrote Safety First! off as an obvious April Fool’s joke then think again, as this physics-puzzler proves itself to be a true hidden gem of the eShop thanks to its clever gameplay and fantastic soundtrack. Combined with the dirt-cheap price, it’s an easy recommendation.